Chase's Back Legs Are Giving In. That is great, southerngirl, that you are doing your best to help Chase. I'm so sorry he's not well. sorry to hear Chase isn't feeling very well. I think Anneke, Tigerlily, Amateur (and the rest) have given great advice! Keep in mind that 16 years is a great age for a (larger) dog, man I wish Mazzel and Boef will reach that age! So I would say enjoy him for as long as you can, maybe make some nice pictures of him! I would get him something for the pain (I think its great that you are looking for a solution for this!). Like some others said I would prefer for a shorter, but painless life rather than going on and on and on when the dog is in pain. I hope Chase will feel beter soon and that he can be a old man for some longer! SouthernGirl, i knew from previous posts that you are on budget and i can understand about not having money. I know you and your mom are helping out multiple dogs there, too. Almost all the vets i know did not go into the field as an attempt to get rich, but to help animals...........and most vets i know are generally kind loving ppl, imo. You've obviously never met a large animal (horse) vet. There all a bunch of grumpy old men that I swear are there to intimidate you and make you feel stupid and inferior. On the other side, I agree, most small animal vets (for like dog + cats) have a real passion for the animals they're dealing with and are very helpful and will usually quite happily give you information over the phone or in the clinic about how to help with elderly dogs and joint pain free of charge. Also remember when looking into herbal remedies that a lot of herbal remedies available in Holland (please don't take offence to this) are often illegal in other countries. Just because you CAN buy it online, does NOT mean it's legal to have it sent to your country. Glucosamine is great for any animal with joint problems such as arthritis or degenertaive bone disease; it's always recoomended for dogs, horses and humans. Other things such as MSM may help, but I'd be calling your vet and asking their opinion (over the phone if necessary - as I said they're nearly always happy to give you some free information and might even be able to prescribe you some medications without having to take your boy to the vet). Good luck! It's not a nice thing to go through - you just have to (as said above) take lots of pictures and think of all the good times you had together - and obviously keep his pain as low as possible. This thread made me sad as the dog I grew up with is also at this age (~14-15), is mostly blind, deaf, but as she's a small dog she doesnt yet have any joint problems and still bounces around happily, but she's skinny (she was NEVER a solid dog to begin with) and it makes me sad because my parents also wont take her to the vet due to the cost. Also Chase's eyes are blue but as he aged they have become cloudy blue it used to be only a little but now his eyes just cloudy blue maybe a little brown. Why? I wanted to clicker train him but I don't know if he can hear very well so I was going to use a light but I wonder if he can see it. As Anneke said, it is most likely something called nuclear or lenticular sclerosis. Basically it's an age related change in the eye, and usually causes no discernible change in vision. It might affect his ability to read fine print but that's about it. 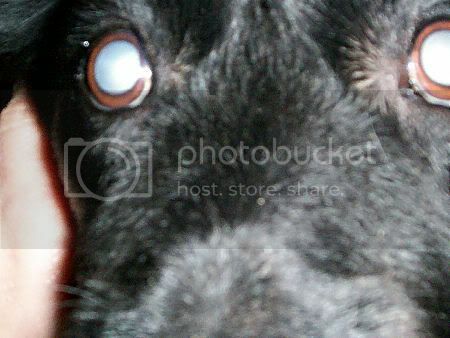 Rarely, if a dog lives to be very old and the sclerosis started in middle age, there is some vision loss. But for the vast majority of dogs, it causes no issues in vision, despite how it looks.